This is my go-to quick appetizer dip. Easy and delicious. Really, really bad for you, too. It would be great for a quick Thanksgiving appetizer. Mix mayo, cream cheese, cheddar cheese, and onion. 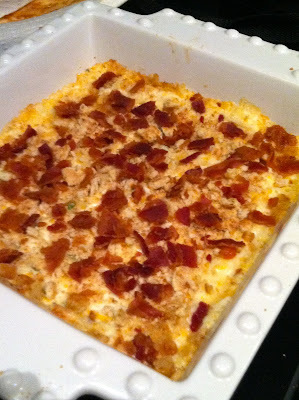 Put in a baking dish, and top with crushed crackers and crumbled bacon. Bake at 350 for 15 minutes. That looks wonderful!!!! Happy Turkey Day!! !